Previous rumors had put a Snapdragon 808 processor in the Priv (damn, it's gonna take some time to get used to that name! ), with 3GB of RAM, and a 5.4-inch QHD curved glass screen. It should run a mostly stock version of Android with tap-to-wake, BlackBerry Hub, and BlackBerry Universal Search. The keyboard seems to be touch-sensitive too, acting like a trackpad so you don't have to reach up to the screen to swipe when typing. There was a time when I wanted a physical keyboard on an Android phone so badly — I even owned an HTC Desire Z for more than a year — but I think I've grown accustomed to on-screen keyboards. That is despite having to type medical jargon, three languages simultaneously (including transliterated Arabic with numbers sprinkled in with letters), and lots of abbreviations. I just turn autocorrect off, and touch type when I know I'll be saying things the keyboard won't ever understand, then swipe (which autocorrects by default) when I'm just using plain English. That combo works for me. But I suppose there are people who really need the accuracy and feel of physical keys. For them, the wait shouldn't be too long. 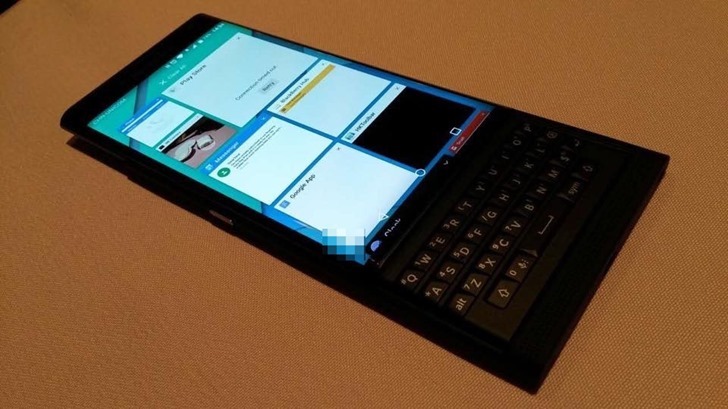 Given the frequency of the rumors, I'd say we're getting really close to the Priv's official unveiling.